There are 15 reviews of Oliban. Where is the olibanum? This to me smells like a feminine version of Chanel Allure Homme Sport Extreme. Lemony, bright, sweet with a touch of blond tobacco leaves in the background, hints of rose and a lot of tonka. The name is definitely misleading. I can understand that the perfumer tried to do something original with the blend, trying not to make it smell similar to other Olibanum centered scents. But when you try too much, you begin to steer away from the main theme in my opinion. I expected something centered around frankincense, hence the name! I don't get anything other than rose- no tobacco, cedarwood and no frankincense. Yet another case where the descriptions and the notes don't match the final smell at all. Projection, longevity and sillage seemed below average. Luckyscent categorizes this as unisex. It's not. This is a woman's fragrance, in my opinion. The previous excellent reviews are able to fully describe the main characteristics of this resinous spicy/oriental aroma. Yes, the olibanum plays as a sort of olfactory backbone in here, initially more dry, cool, sparkling and woody ( i would say more properly incensey with a peppery dustiness, a sheer "volatility" and the sharp woodiness from the atlas cedarwood) while in a second stage more dense, "tasty", attractive, warm and ambery with a more rounded consistence coming from balsams, sweet spices and tobacco and with a floral twist arousing from an earlier emerging rose (that i soon catch on the side of the cedarwood in the middle of the initial incensey dust). The dry down (after hours) smells prevalently ambery, honeyed (with its wonderful honeyed tobacco presence) and finally slightly leathery. The note of frankincense is anyway still swirling around throughout in the background with a notable stickiness (anyway, it is no more straightforward but soothed and enriched) and the leather completes the olfactory evolution imprinting a soothing (suede type) and more dry/silky new touch after the central (long) humid/syrupy honeyed phase. In this phase and yet after the first hour of development i start to smell some olfactory similarities between this one and the lovely (but far more feminine and sophisticated) 06 Incense Rose by AndyTauer because of the similar floral/spicy/ambery temperament of the incensey approach. The honeyed type of incense reminds me (just) vaguely some by Kilian Incense Oud facets where the incense is anyway probably less honeyed/vanillic and more musky/labdanum centered (putting apart for a while the Incense Oud's agarwood presence and isolating for a moment the cedary, peppery, rosey and honeyed side of the incensey combination). I detect effectively some points in common (prevalently in the dry down) with the resinous/rosey/woody side of my lovely Feminite du Bois which is probably less resinous/incensey and more centered over the musky orange/peach/ylang ylang accord (which turns it out more fruity, exotic, feminine and juicy). Unisex but leaning on the feminine side in my very humble opinion. Another great stuff for us guys. 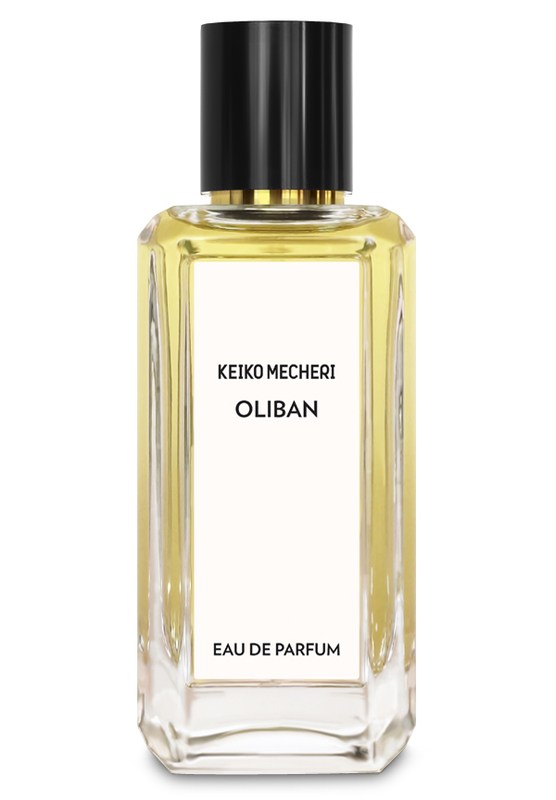 Oliban by Keiko Mecheri - Initially, one is treated to a magnificent shower of mystical frankincense. The lovely, sweetish, citrusy character commingles with the cedar chest aroma of atlas cedarwood, with its aromatic fruitiness and ever so slightly camphoraceous, some might say urinous, whisper. This vivacious brew meanders to the waiting heart. Here, a deliciously seductive, red rose with fruity glimmers and a cabernet-like facet sparkles somewhat. A delightful honey marries with the enchanting rose and imparts its enticing sweetness. An exotic undertone is furnished by a much subdued olibanum. Transitioning to the awaiting base, a select blond tabacco imparts its floral, vanillic, and smoky facets. A magical amber supplies hints of vanillic cherry, almonds as well as leather. Shadows of tangy frankincense flitter about. A charming drydown ensues. This well-blended, elegant composition leans substantially to the masculine side, and has radiating projection for maybe two hours, then settling to a skin scent, as well as average longevity. If you like frankincense but you're not into "church-y" kind of fragrances, Oliban is a fantastic option. The incense here is very similar to the one in both Eldo's Like This and Divine's L'Homme Sage. It's definitely remarkable and playing a main role but it's so well blended with all the other elements to never give the idea of a midnight mass or a gothic cathedral. Oliban opens incredibly beautiful and catchy with pungent resinous notes enriched by a slight peppery vibe. Rose, amber and tobacco make their appearance adding depth and some sweetness. An intrigant composition that despite its name, offers much more than simply incense. Warm, consistent and extremely charming. My only complain, if I can call it so, is that while the drydown is absolutely comfortable and pleasant, is still nowhere close to the outstanding and intoxicating opening. Quality stuff, anyway! Is this supposed to be just pure Olibanum (frankincense)? At first I'm surprised how floral and yet not super-feminine it is, almost like a spiced Gendarme scent. I really like the combination of spices, but then if this is just a single note, that means I like frankincense, and have liked it all along as part of my "just right" spice / resin mix. The middle is a bit too rootbeery for me after the florals fade, but also has an intriguing orange peel aspect that redeems it. As I smell the basenotes on the fingers I used to open the vial, it seems so familiar. It reminds me more of Santa Fe for Men than anything else (very sweet spiced wood), but most of my spicy wood scents obviously owe a lot of their character to this stuff. By itself, it's quiet and delicate, but I'm still not sure I'd call it feminine because it's too pointed for that. I also don't know what to make of it in terms of treating it like a soliflore or a composition. Fairly nice though. There are no member images of Oliban yet. Why not be the first?